Learn how to make a sidewalk for your yard by using simple tools. You can save a lot of money by doing your own labor. Building sidewalks is much easier than people think it is. First of all, decide how wide you want to make the sidewalk and how long it will be. You also will need to know how deep into the ground you have to dig to lay the forms. 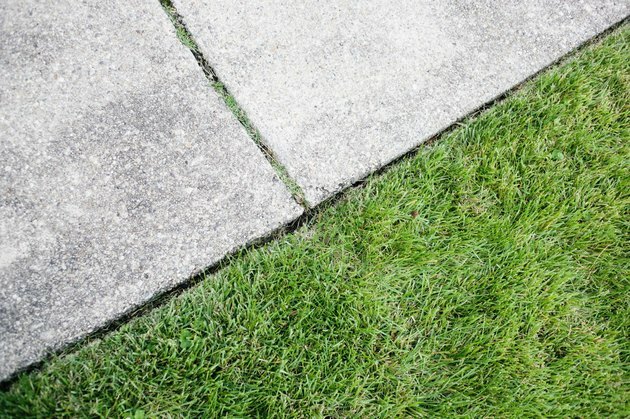 If you're putting in a walkway before you start a new lawn then you will need to keep the walkway on top of the ground. If you are setting the walkway into an existing lawn area, then you will need to dig down a few inches so the sidewalk isn't too high. Sidewalks that protrude or are too high become tripping hazards. A sidewalk is a fairly simple concrete project. Let's suppose our desired sidewalk is four feet wide and thirty feet long. This will be a walkway where we'll dig into the ground exactly 2-inches. We need to measure the width across the sidewalk area which we know is 48-inches, but we also need to dig the extra area to compensate for where the forms will go. The forms for sidewalks are usually 2x4 studs. 2X4's are inexpensive and easy to work with. The width measurement across the sidewalk includes the thickness of the 2X4 stud on each side. The board thickness of each 2X4 is 1-1/2-inches, so just add 3-inches to the width of the sidewalk. This gives us an area of 51-inches across to dig. Of course, we can dig out a wider area and backfill the dirt once the sidewalk is finished. The dug out area is 51-inches wide by 30-feet long. Sidewalks are usually excavated with a shovel because the depth is shallow. Make sure the area is level and it is always a good idea to tamp the dirt where the cement will be poured. After that, we can put in the 2X4 forms. A good way to connect two 2X4 studs is by nailing a 2X4 block on the exterior side of the forms where the joint will be. This keeps the forms secure. Next, make sure all the forms are even with a measurement of 48-inches the entire length of the sidewalk. 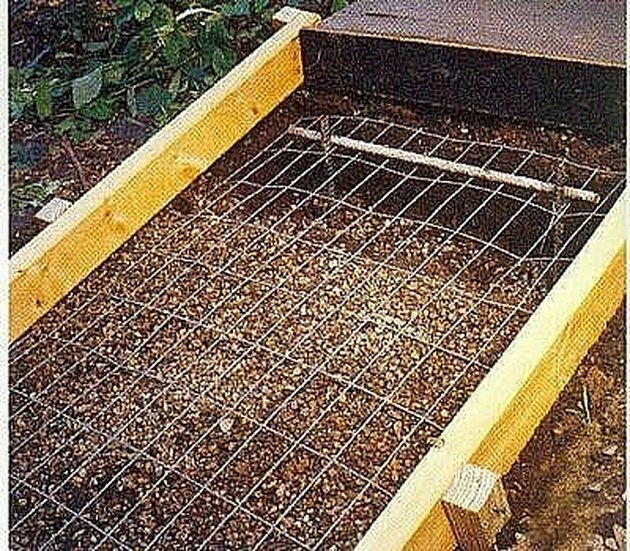 You won't use rebar like you do when pouring foundations, but you will need a wire mesh made for sidewalks. If you're making a really small sidewalk, then you can just buy bags of ready-mix cement, add water and pour it in, but for most sidewalk projects, you probably need to call a cement company to deliver and pour the cement. 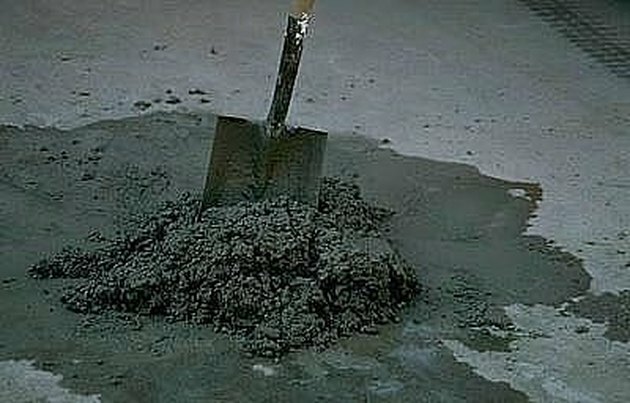 The type of cement used for sidewalks is a smoother kind of cement than the cement used for foundations. Cement for foundations is called "5-bag mix, but sidewalk cement is a "six-bag mix. That means it has a higher cement content and uses a smaller aggregate material. The cement company will know what kind to bring when you tell them the cement is for a sidewalk. They will ask for the dimensions of the sidewalk and they'll calculate the amount of cement you'll need. Cement is measured and sold by square yards. Let's take our sidewalk measurements as an example. Our sidewalk is 30-feet long, 4-feet wide, and 4-inches deep. So the square footage is 120 square feet by 4-inches deep. We can convert this to square yards by dividing 120 by 27. There are 27 cubic feet in a square yard of cement. This calculates to 4.44 square yards, but we still have to divide that number by 3 because the walkway isn't a foot thick, it's only 4-inches, which is one-third of a foot. So the final amount is around 1-1/2-yards of cement needed to pour in the sidewalk. The cost of cement varies by location, but if you live close to the cement company, you can get it for around $90 per yard. Now, we can pour the sidewalk. The cement company will pour the cement, but you will have to shovel it around to get it into the forms evenly. You can jab the cement constantly to pop air bubbles. 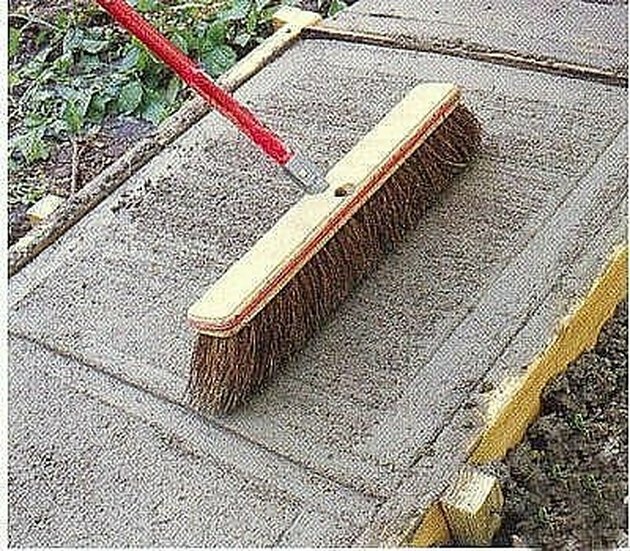 Once the cement is completely where you want it, you will need to make it smooth on top. 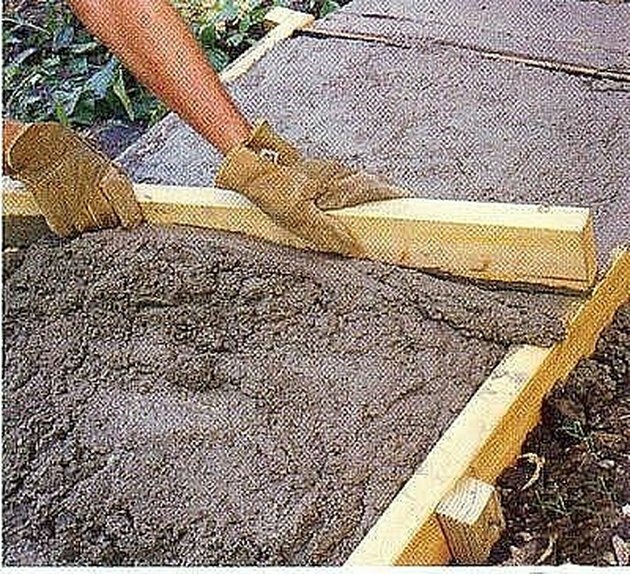 You can buy a screed or use a level 2X4 to run across the top of the cement several times. This will make it smooth. Once the surface is fairly smooth, you'll use a float or a long trowel to bring the smooth cement to the surface. This will create a smooth surface and will make the rougher aggregate material sink beneath the sidewalk surface. You will need to let this dry for a few hours before brushing the smooth surface with a shop broom. Brushing will give the sidewalk surface a little traction so people don't slip on the smooth surface. Be careful not to press too hard while brushing. After about three days, depending on the temperature, you can remove the forms and start to back fill around all the edges of the sidewalk so they're even with the lawn or ground. Ideally, the sidewalk should be about a ½-inch higher than the lawn. For the last step in the sidewalk construction, we should cut sections in the concrete so it doesn't crack or break with movement of the ground underneath. You can rent a concrete cutter or just use a concrete blade on a circular saw and cut across the sidewalk about every ten feet or so. This gives the sidewalk flexibility during expansion and contraction of the soil. That's how to make sidewalks. We usually save around two-thirds the cost of a professionally made sidewalk by doing it ourselves.